I've spoken once or twice about my hearing loss on my blog before, I'm mostly deaf in my left ear and have minor loss in my right ear. I've had hearing loss since birth and it has gotten somewhat worse over the years. I got my first hearing aid at 21 but honestly, I've had nothing but problems with them so haven't worn them regularly ever. I've finally gotten a new one that so far seems to be working great for me! 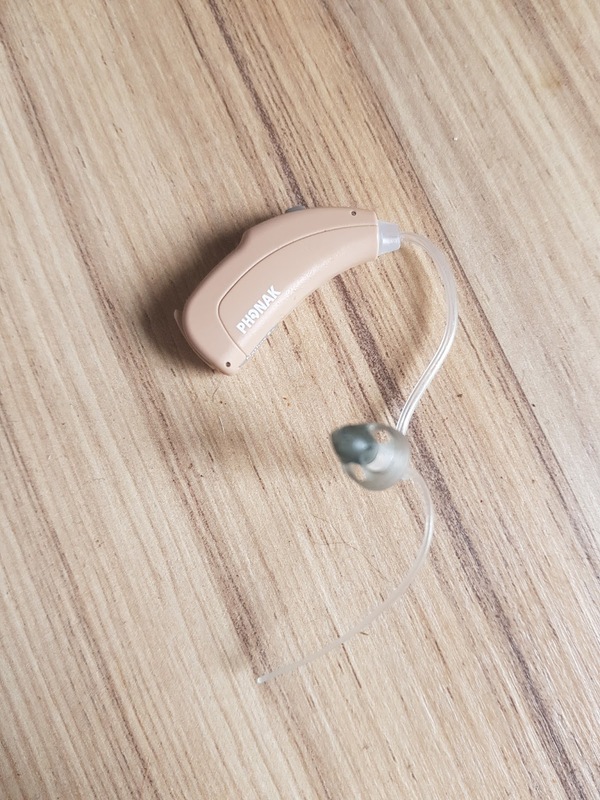 This is my old hearing aid. 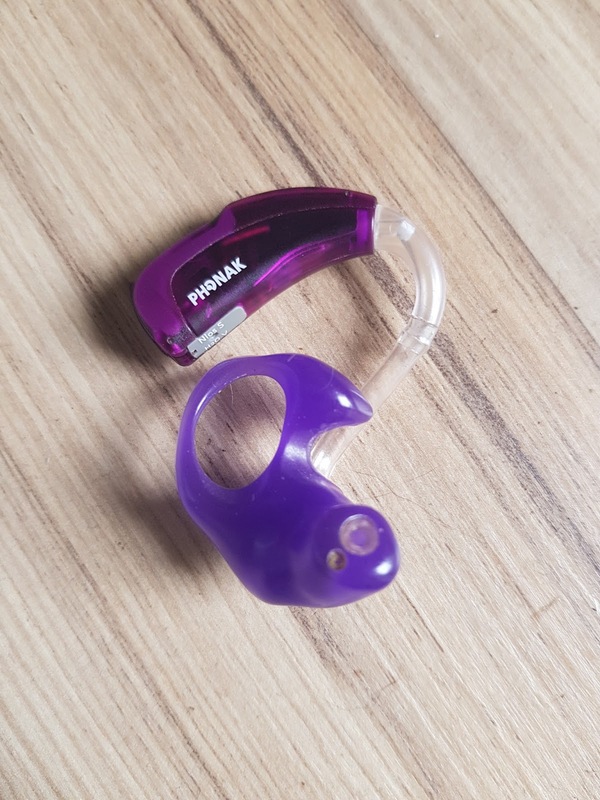 I've always had NHS hearing aids so they are the traditional BTE (behind the ear) type, and the larger purple sections goes into my ear and fills in the canal. Normally hearing aids are a standard beige colour that is allegedly skin coloured. They are considered the standard 'skin colour' which is obviously problematic, and in no way are they remotely actually skin coloured. My old ENT kindly let me have a purple hearing aid because I had purple hair and he thought I'd appreciate it. I did! Usually colourful hearing aids and those with stickers are for children to encourage them to wear their hearing aids. 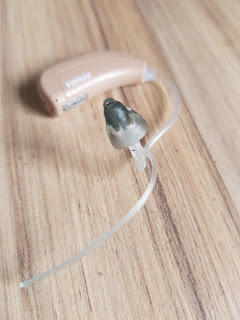 I suffer with eczema and swimmer's ear and unfortunately this style hearing aid exacerbated both of those conditions, meaning I couldn't wear the hearing aid. This is my new style! Still a BTE, but instead the receiver sits inside my ear canal, and the other tube sits in the outside of my ear to keep it in place. It's essentially invisible in my ear bar the small see through tubes. I'm not particularly bothered about it being visible, but I know some people feel self conscious about them. The inner ear design means more air gets into my ear so my skin conditions don't seem to be affected by it so far. It's really comfortable and the sound quality is brilliant. It takes a while to get used to it, my brain needs to re-learn which sounds it needs to filter out as background noise, at the moment everything is just quite loud! Right not it's all quite new to me, it's the first time I've been able to wear a hearing aid for years with any regularity, I was rather aghast to discover that I actually speak incredibly loudly (which I'm sure everyone who knows me IRL will say 'well duh' to). That's cool that your ENT gave you a purple one, I would probably prefer that too than the false 'blending in' aid. i love how they gave you one to match your hair! thats so cute! sadly not this time but all my previous ones did!